As concepts go, a seafood restaurant located 300 metres from the crest of a wave is a pretty good one. And while Brighton might lack the glitz (and weather) of Miami Beach it more than makes up for it with individual style and quirky food scene. Leading from the front in terms of both attributes is The Salt Room. 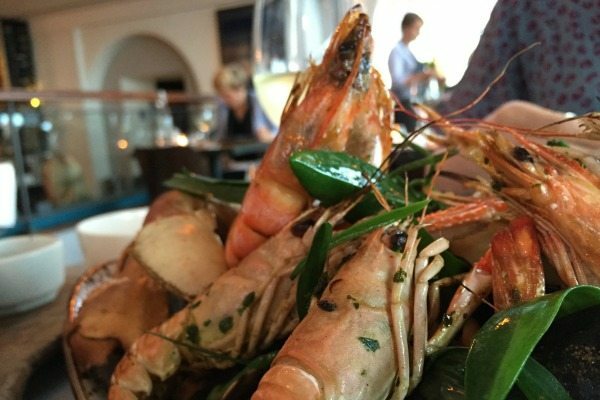 Opening in early 2015 it has already been named in the prestigious National Restaurant Awards Top 100 (2015) and came 3rd place in Brighton’s Best Restaurant Awards in February 2016. So from the offset things were looking good, it was a sunny evening as my friend and I strolled along the seafront, marvelling as always at The Grand Hotel’s opulence and reminiscing the days when the West Pier wasn’t so skeletal. The Salt Room stands out amongst its neighbours due to the modern styling, quite the opposite to the more traditional hotels and restaurants along the strip. 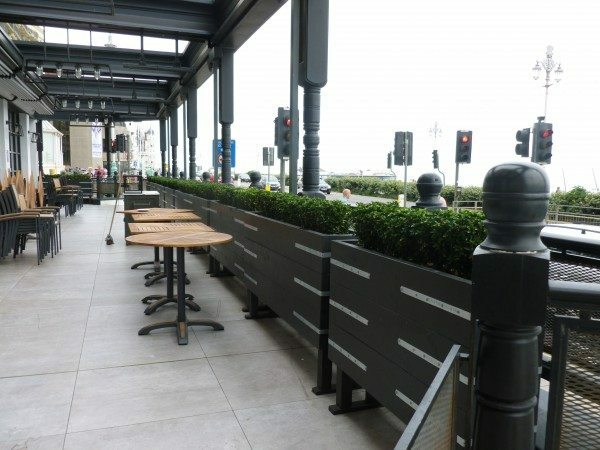 The alfresco dining terrace seats 55 covers and is one of the smartest outside areas I’ve seen in the city. Taking a seat on the terrace we were in prime position to catch the evening sunset which is really quite magical, floating down the sky into the sea to the west of the restaurant. We are greeted warmly and given our menus, split into sections such as ‘raw’, ‘chilled’, ‘mains’ and ‘from the grill’. 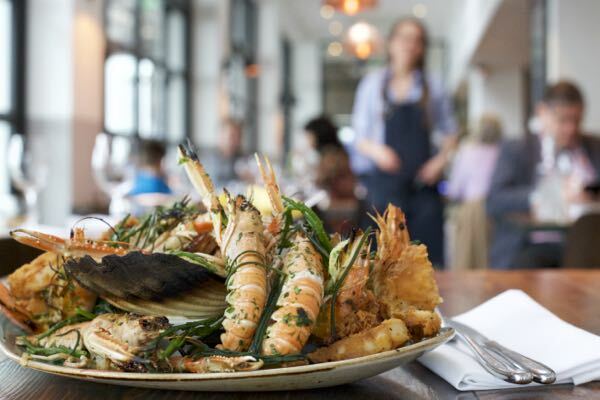 It’s testament to the popularity of the restaurant that I feel like I know quite a few of the dishes already, after following them on social media and seeing the delicious sharing mains and desserts – A Taste of Pier anyone? A crisp glass of white was at the forefront of our minds so we asked for recommendations from our waitress, who suggested we choose from their ‘Salt and Shell’ section, a collection of ‘salty whites’ from coastal vineyards. The salt in the terrain lends an incredible minerality to the wines which works well with the seafood dishes on the menu. We chose a bottle of the Urra di Mare “Sigh of the Sea”, a Sauvignon Bianco from Mandrarossa, Sicily (£27). 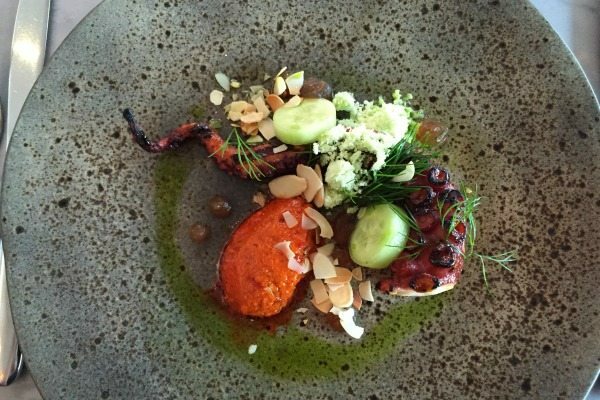 To start I went for the coal-roasted octopus, nduja, almonds, dill, cucumber and Emily had the Wood pigeon, artichoke, coffee-cured duck liver, cherry, hazelnut. The octopus tentacle was chunky, charred and perfectly tender after being cooked on the Josper grill. The nduja (spicy, spreadable pork sausage) added a fiery hint which was in turn cooled by the cucumber. It was a clever combination of flavours and a great summery starter! Emily’s plate was like an ode to a country garden with scattered hazelnuts and nasturtium leaves adding an earthy quality to the dish. 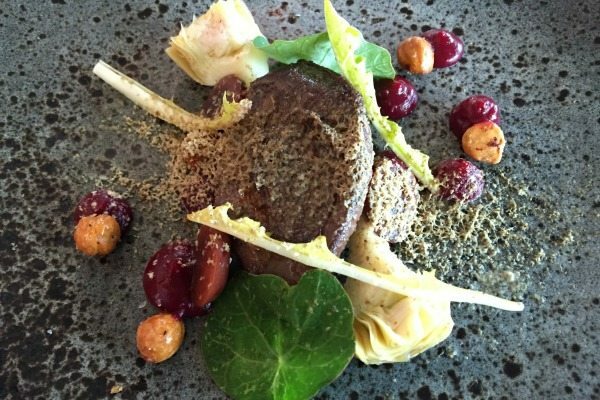 The wood pigeon was packed with flavour and cooked medium rare, a gamey treat quite unexpected in a seafood restaurant. The coffee cured duck liver had been frozen to enable the chefs to grate it finely over the pigeon which added a hint of richness without overpowering the taste of the accompanying ingredients. Clever indeed. Our main course just had to be the Surf Board (£50 for two to share). The board boasts a selection of hot fruits of the sea, including coal-roasted oysters, Scottish prawns, scallops & squid. For some reason I was worried that it wouldn’t be enough for two (oh how wrong that was!) and almost ordered sides but luckily the waitress informed us that the dish came with a side salad, chargrilled bread and chips – perfect for mopping up the garlic butter. I was in seafood heaven. Equal portions of fat langoustines, prawns, calamari, mussels, clams and even an oyster for luck. It’s one of those dishes where it’s a case of sleeves up and get stuck in and messy – perhaps not perfect for a first date (or maybe it would break the ice?) but Emily and I had no airs and graces to uphold so get stuck in we did. I love a sharing plate (unlike my long suffering other half) and I enjoyed talking through each part, discovering one taste after the other and dipping the chips into the buttery sauce that pooled on the plate. A nice touch was that they give you tiny hand towels in a bowl which when water is added grow to full size to clean sticky fingers – smart idea. 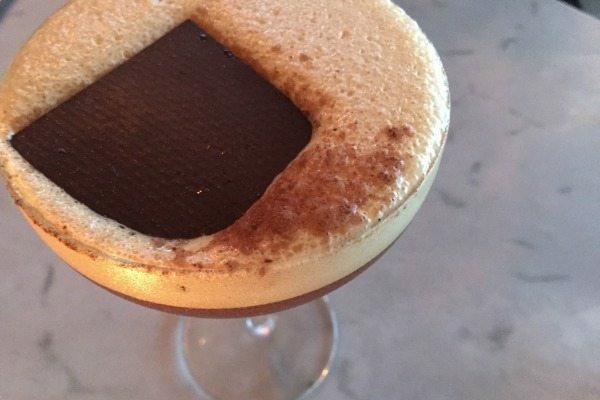 After a short break I decided to crack on with dessert, whereas Emily had coffee on her mind choosing an espresso martini over a sweet plate. 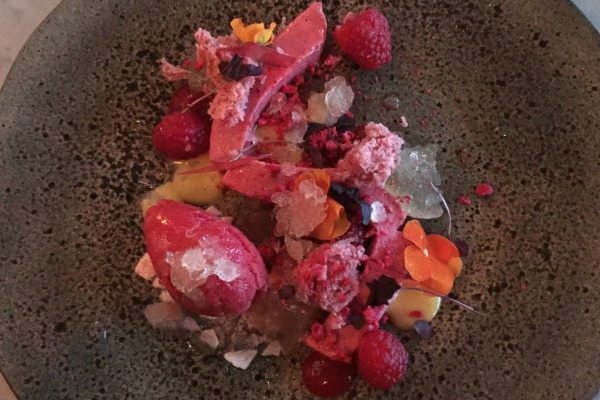 I tend to go for fruity desserts over chocolate and luckily there was a dish right up my street, Raspberry, kombucha, yuzu & watermelon, Frozen raspberry mousse, watermelon kombucha, yuzu curd. A mouthful to read but on the plate it looked like an explosion of summer, with different shades of pink interspersed with edible flowers. Almost too pretty to eat, but when I did dig in it tasted even better than it’s appearance, and the kombucha lent a lightly effervescent taste on my tongue, reminiscent of popping candy. We left the restaurant feeling satisfied but not overly stuffed. Happy that we had eaten such a beautiful selection of seafood that is so locally sourced and that supports the fishing industry on the south coast of England (the majority is landed in Newhaven). 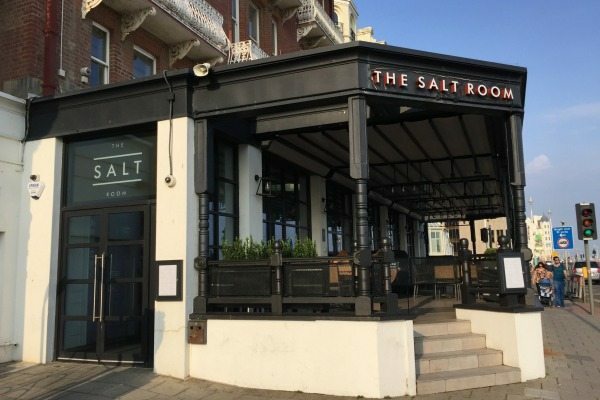 It may not be the French Riviera, but going alfresco at The Salt Room is a sophisticated and delightful way to spend a summers evening in our wonderful seaside city.